Planning for the expenses that come along with a new baby should be easy. This baby budget format is especially great in budgeting for these expenses. There are two separated sections: Ongoing Expenses and One-Time Expenses. In the Ongoing Section, there are six columns: Item, Details, Frequency, Monthly Cost, Year Total and Average Monthly Cost. Beneath the Item column, you would list the expenses that you want to include in the budget. Next, under the Details column you would specify exactly what the item is. Then you would input into the template, the frequency of purchasing the item and any of the costs associated with this item. In the One-Time Section, there are six columns as well. These columns are titled: Item, Details, Quantity, Unit Cost, Total Cost and Registered? Below the Item column, you would again list the expense that you would like to include in the template. Then, specify exactly what the item is in the Details column. Next, you would list the quantity of the item, followed by the unit costs, total costs and whether or not you are registered. 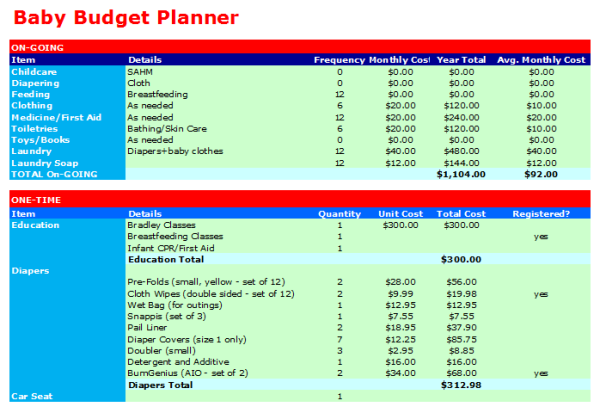 Once you input your information into the template, your Baby Budget Planner will be complete. With this budget planner, you can see the whole picture of what your total expenses will be and what they are being spent on. If you wish to make changes, you can do so easily to tailor the template to your needs. © 2019 Budget Templates for Excel. All rights reserved.